This brick and stone rustic home features an eye-catching timber beam gabled front porch and open floor plan. The Great Room has a 12' ceiling and is open to the spacious kitchen and dining room and has access to a large Sun Room. The kitchen offers a prep island as well as plenty of counter space and an eat-at peninsula bar. The Master Suite has a gas fireplace and multiple windows for natural lighting while the bath boasts a corner whirlpool tub, a glass shower, dual vanities and a huge walk-in closet that doubles as a Safe Room. 2 more bedrooms share a bathroom on the right side of the house. Off of the Sun Room is an Outdoor Living/Grilling Porch with a fireplace for cool evenings. 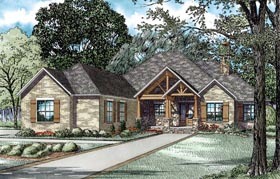 Question: Does 82229 House plan come in a smaller version 2300 to 2600 sq.ft. Answer: See plan 82313. It is a smaller version, but it's 2,879 SQ FT. Question: Would you be able to help obtaining structural and MEP plans for the house? Would need a structural engineer to do load calculation, design foundation and structural framing plans. Also, MEP. Thx. Answer: We cannot provide engineering. This can be done locally by purchasing the CAD files. Question: I notice there is no coat closet in the Foyer area. Is there something I'm missing? Answer: This is a unique and very spacious design; however there is not a closet at the front entry. there is a kids-nook aka bench with coat hooks at the garage entry. Question: Is there bonus space in the attic? Answer: not at this time; very minimal floor to head height. Question: Hello! We aren't ready to build yet, but this is our "go to" plan that we compare every other plan with! We are very interested in ICF construction. Is this plan adaptable to ICF? Thank you very much - and have a great day! Answer: Yes, the plan below can be modified to meet ICF; the designer uses BuildBlock ICF- if another ICF company is desired for the plan, the PDF files will need to be ordered to have ICF company of choice to convert plan to the ICF plan desired. Question: What is the primary plateline/ceiling height if not shown on the floor plan? Answer: The main floor ceiling height is 10’; the great room kitchen open area is noted 12’; the plate line alters on this plan because of the different ceiling heights. Answer: Please see plan 82333. Plan is smaller sq ft because sun room sq ft is not included in h/c; it’s also converted to a screen porch. If customer wants sq ft to be closer to 2500 on plan 82333, they can reduce the media study room depth; room can also serve as a 4th bedroom. Question: Where is the master bedroom closet? Answer: The master closet is also the safe room. If customer chooses to do away with the need of a safe room, builder onsite can change the 8” concrete walls to 2x4 / 2x6 walls. Question: Can the ceiling in the living room area be vaulted? Answer: The great room/living room is vaulted on the plan. There are 2 different perforated set of lines in that space, the vertical lines are timber beam (decorative) posts that goes up to the horizontal line in center of plan that indicates the vault. The vault starts at the plate line on the floor plan (12’ plate line) and goes up as much as the space above will allow in a 10:12 roof pitch. Also the timber beams are 8x8 beams, not structural decorative for rustic interior style. Question: where are the steps to the basement located, for the basement foundation option. Answer: At the moment, a basement stair location for home plan is not available for viewing as the placement is typically alongside an area that will allow for enough head clearance to go down into basement. The space between the garage and master suite / half bath is a typical location as this will add approx 4’-5’ to the depth of house plan as to make room for stairs on plan. Question: What is a safe room? Answer: The safe room in a house plan is an 8” concrete room that serves as a shelter room from tornadoes on the main level of the house plan. In many locations where a basement level house plan is not permitted, tornadoes are very active, so we incorporated main level shelter rooms so that those families could still have a safe location from the storms. Answer: Thank you for your interest in our home plan design. Please view our plan 82162 for a similar layout with the sq ft that you desire. The bonus room is optional and is not apart of the total living sq ft noted at 2340 sq ft. Some other plans with similar layouts are 61231 and 61269.